I put together a few ideas to share in case you also have a child who would like an art related gift. 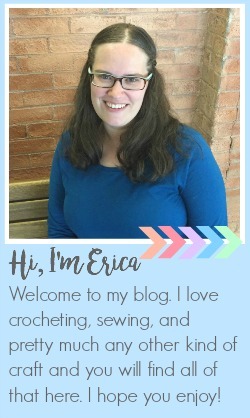 I ordered a bunch stuff from Consumer Crafts to show a few different types of kits you could put together, as well as what I actually plan to use and how I am going to use it, and where you can find all of the things I will show. The first option I wanted to share is the art kits you can buy that are all put together in a case. They usually include colored pencils, markers, paints, crayons, pastels, or some combination of those. You can find lots of different sets with a huge range in price depending on the size and quality of the supplies. 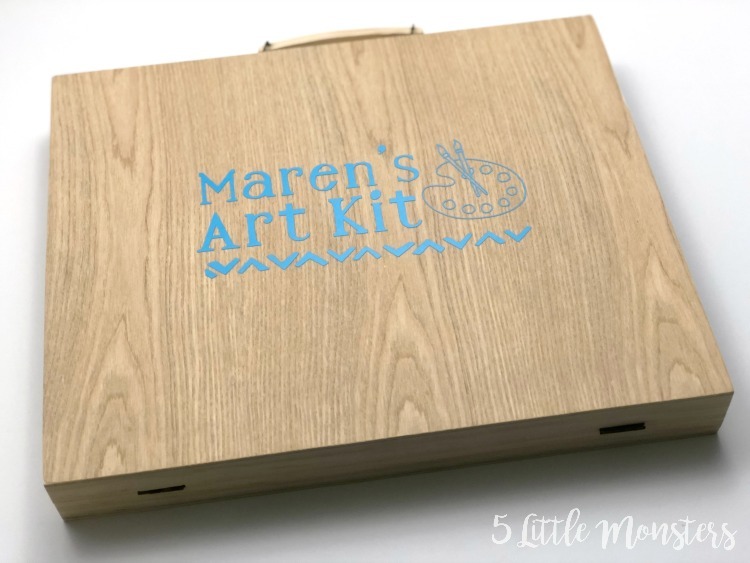 I wanted to find a way to make it a little bit more personal so for this example I chose a kid's art set in a wooden box. I chose the wooden box because I wanted to be able to add a vinyl decal to the top of the case. I cut out a simple design on my Cricut and stuck it to the top of the box. I thought this touch made it a little more personal than just a box. 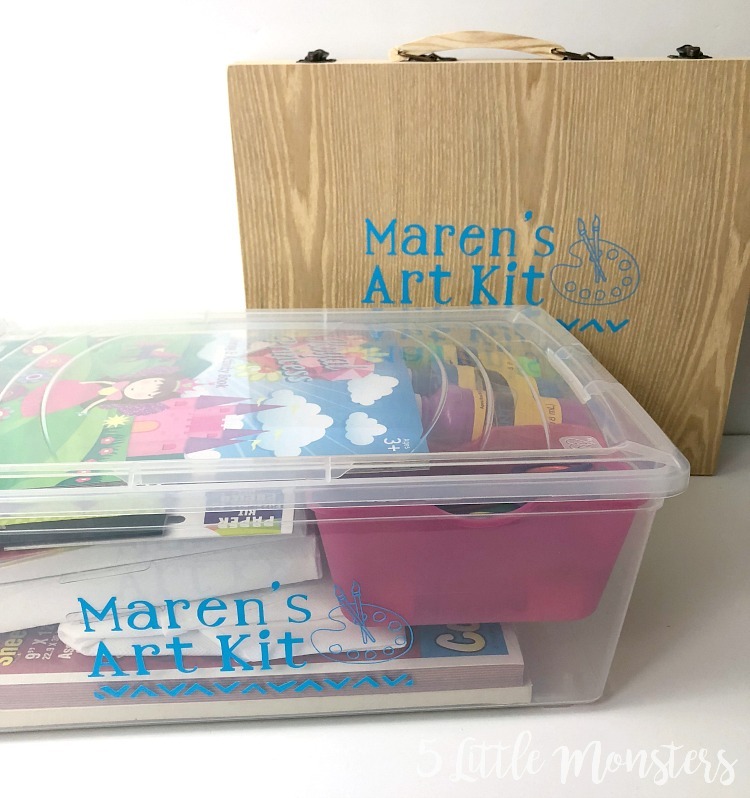 If you want to put together your own kit instead you can choose individual supplies that you think your child would enjoy using and put it all together in a box yourself. 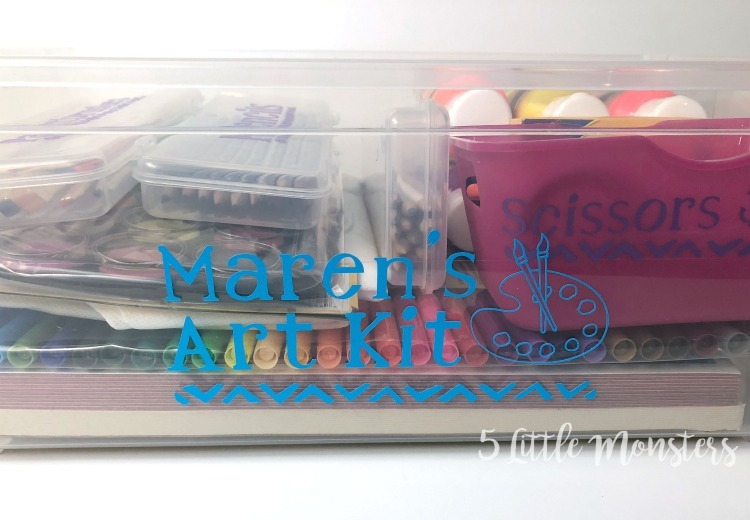 I put together a kit that included several of the things in the pre-made kit, as well as a few other items I thought my daughter would enjoy. I had a 5 year old in mind as I chose items, you may need to change things a little for an older or younger child. Just like in the other kit I included a set of colored pencils, a box of crayons, a pack of markers, pencils, and a set of watercolors. 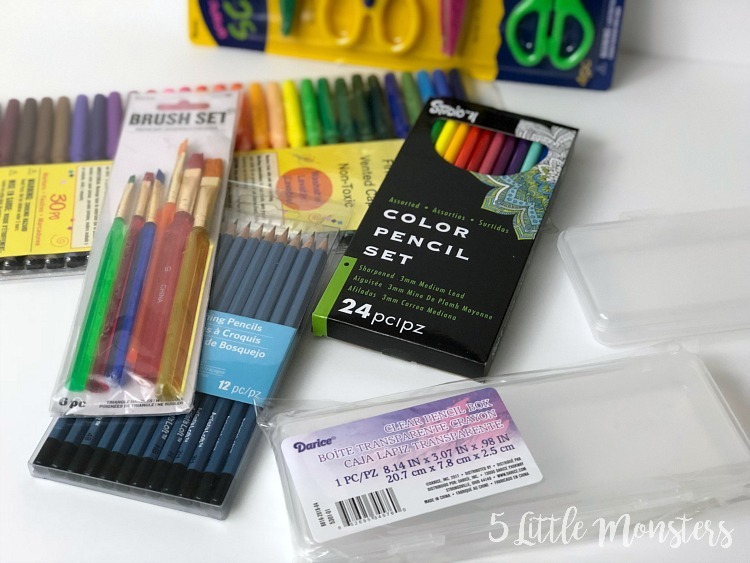 I also included some tempera paints in bright colors, a pack of paintbrushes to go along with the paints, an art smock, some glue sticks, and a set of scissors that included straight scissors and scissors that cut a zigzag or wave design. In addition to those supplies I figured she would need some paper to draw on, or to cut and glue. I ordered a scribble pad (or for an older child you would probably want a sketchbook instead), as well a pack of construction paper. Just like I did for the craft kit I shared earlier, I wanted to give a little bit of personalization and organization to the kit. 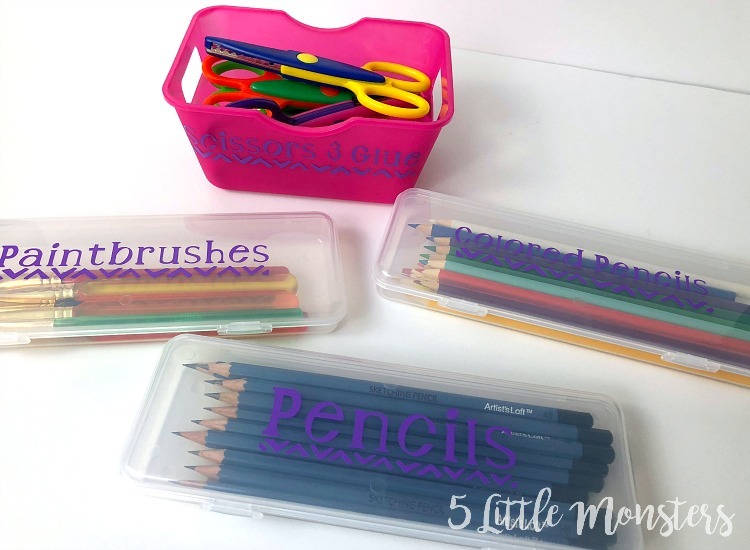 To do this I ordered a few little clear pencil boxes. I sorted some of the supplies into the pencil boxes and then labeled them with vinyl. 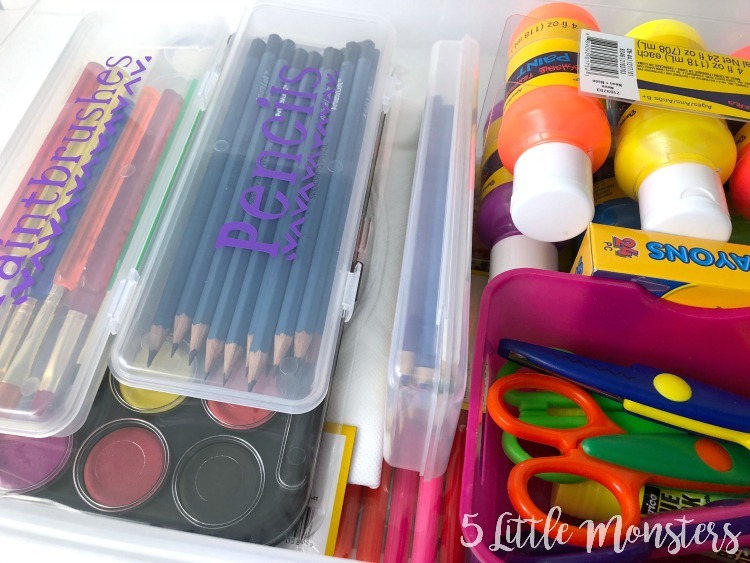 I also used some mini bins to hold other things like scissors or glue. Then just like with the craft kit I got a large plastic box that could hold everything and added a vinyl label to it as well. I felt like this was a good way to keep everything organized and in one place. When she feels like making something she can just pull out her box and everything is there and together. It can fit in a closet or even slide under her bed to be out of the way until she is ready to use it. Another fun thing to add is some ready to make projects. My kids love these types of things and they are really inexpensive, a lot of them are only $1.00, they would be great for stocking stuffers too. I ordered some wooden ornaments that can be colored with markers, wooden puzzles to color, a wooden frame, and a kit to make bookmarks. I also got a couple of canvases with a design printed on them to paint. They include little paint pots and a brush, I chose a heart canvas, and a sea creatures design. 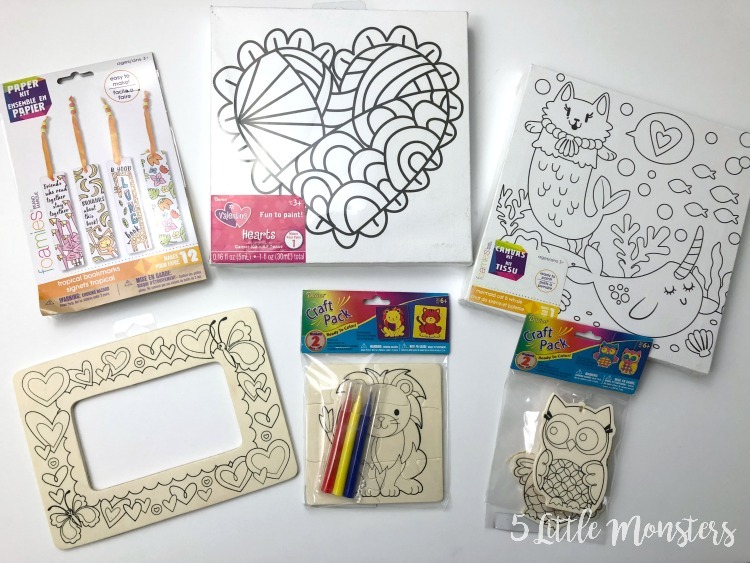 Another fun and inexpensive thing to add to your set, or to get on their own are coloring and activity books and sticker pads. All of these were only $1.00. I chose a few girly coloring books and sticker sets but there are tons of designs to choose from. 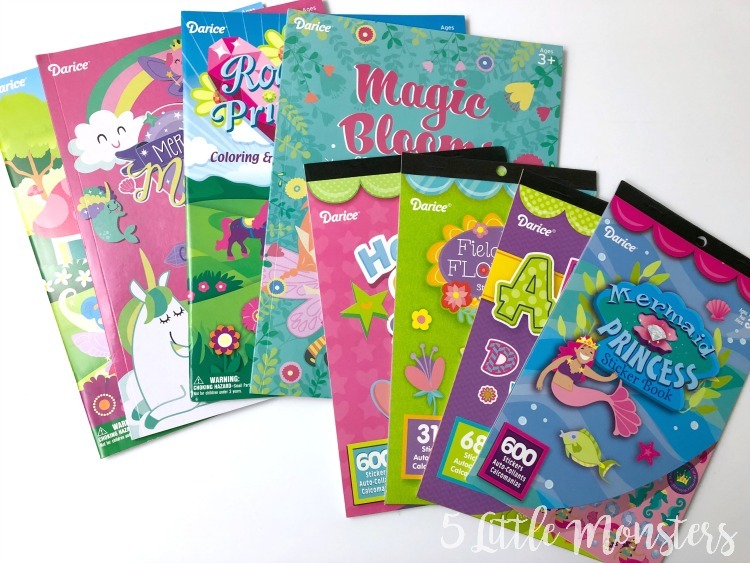 I went with Magic Blooms, Royal Princess, Mermazing Magic, and Garden Fairies coloring books, and Mermaid and Princess, ABC's, Fields of Flowers, and Hearts and Stars sticker pads. 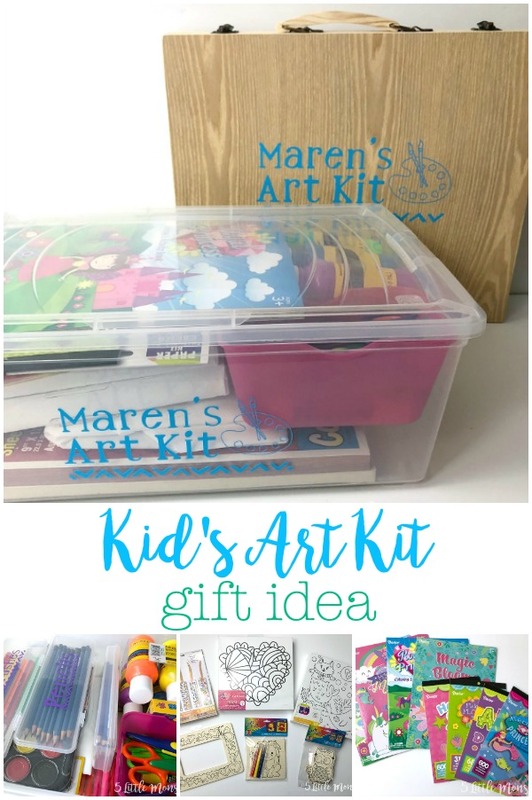 In this post I wanted to show a few different options you could use for gift ideas for kids who love art. Obviously you wouldn't use all of these ideas at once. 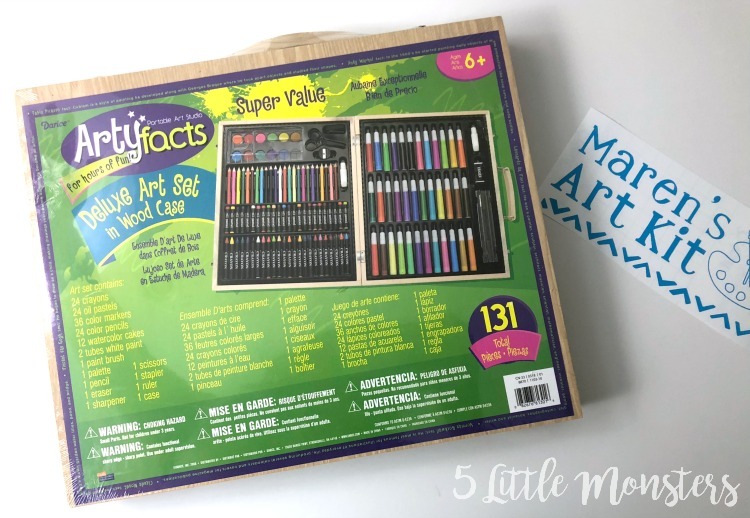 It wouldn't make sense to spend money on a pre-made art kit and then also buy all of the supplies to make your own. You can mix and match everything to work for you. I plan on combining the wooden kit with some of the other supplies, leaving out the things that would be repeats. The wooden box will have all of the crayons, colored pencils, markers, and watercolors. 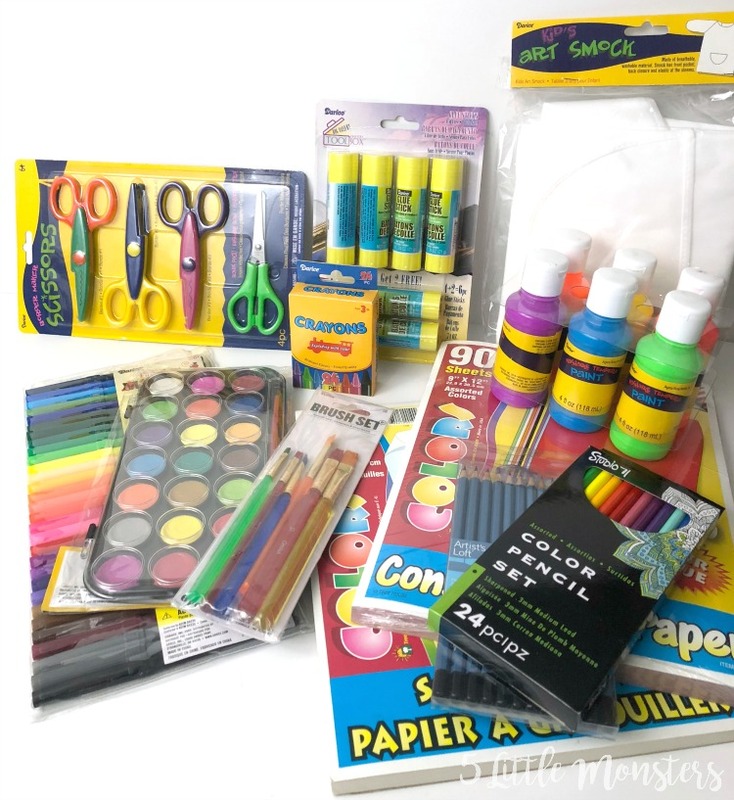 Then in the plastic box I will include the art smock, the tempera paints, the construction paper and doodle pad, scissors, and glue, as well as some of the projects to make, coloring books, and stickers. That way she will have everything she needs to create whatever and whenever she wants. Although the paints may actually be put up somewhere where she has to ask to use them, I'm not sure how much access I really want her to have to those. I think this will be a fun way to gift a Christmas of creativity and fun.